PHP is everywhere .PHP is popular server-side scripting language which is especially designed to developed dynamic and interactive websites. It is the widely-used, free, and efficient alternative to competitors such as Microsoft's ASP. PHP is perfectly suited for Web development and can be embedded directly into the HTML code. 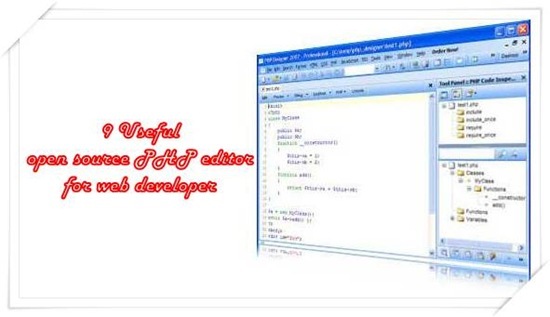 The PHP syntax is very similar to Perl and C.
So if you looking for Free and powerful open source PHP editor ready to use in your web projects and easy to customize, take a look at this list with 9 Useful open source PHP editor for web developer. Bluefish is a lightweight multiple file editor targeted towards programmers and experienced web developers, with many options to write websites, scripts and programming code. it supports many programming and markup languages such as PHP, HTML, Java, C, XML and it focuses on editing dynamic and interactive websites. The program offer What You See Is What You Get(WYSIWYG) interface which allow you to edit Multiple document. you can easily opens 500 documents (tested with 3500 documents simultaneously). PHPEdit is a fully featured integrated development environment for PHP specially designed for professional users. It contain all the tools you will need to carry out your web application projects such as code insight, code auto completion, syntax-highlighting, integrated debugger, code browser, keyboard templates,customizable shortcuts and more than 100 scriptable commands. PHP Coder is a free IDE developed for PHP programmers. Through tight integration of the PHP interpreter and the PHP documentation, PHP Coder gives you a time-saving Development Interface. The program offer various features such as Integrated Preview window, Full Syntax Highlighting for HTML and PHP, AutoComplete for frequently used text constructs, Project manager, and Tag Buttons. Win32Pad is a fully featured text editor that specially designed for programmer. it main goal to provide enough functionality that is missing from notepad without sacrificing file size and performance. It included so many useful features to make your experience better, easier and more efficient such as unlimited file size, line numbers, recent file list, file change notification, WIN/MAC/UNIX format support, system tray icon and more. Context Editor is a free, Multilanguage supported text editor. It offer powerful syntax highlighting supports for widely used scripting languages including HTML, PHP, Java, VB, SQL, Python, Perl and many others . It also includes a macro recorder, project support, bookmarks and much more. Context editor is highly customizable editor which allow you to change syntax highlighting colors, cursor shapes, margin, gutter, line spacing as well as user definable execution keys and other things.